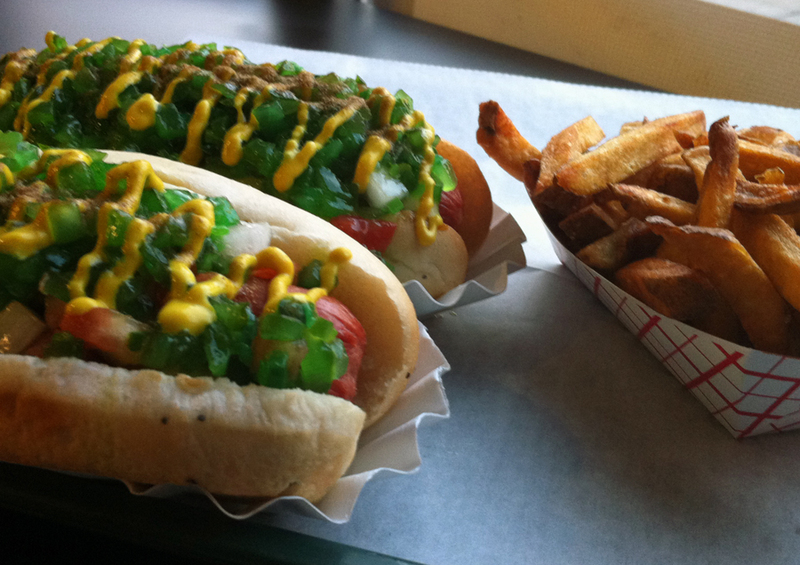 grubbus: Comfort Food in East Lansing: What Up Dawg? There are a couple of places that are important to scout out in a new city: ice cream, doughnuts, and chicago dogs. These things are my comfort food. It would be nice if my comfort food was apples, bran muffin and wheat grass, but such is life. 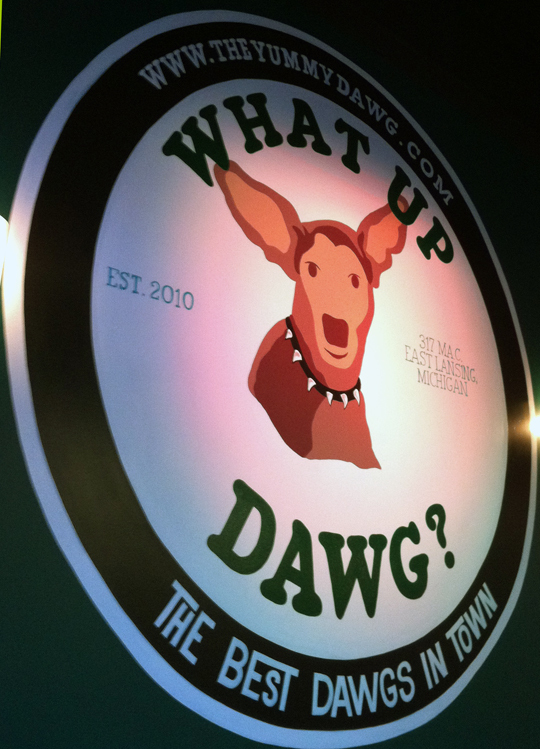 Today: East Lansing Chicago Dogs at What Up Dawg, a start-up hole-in-the-wall a couple of blocks from Campus on M.A.C Ave. Though easy to miss walking by, once inside, What Up Dawg is a surprisingly put-together little space. It's sparse and modern, with dark concrete floors and halogen lighting. Not that this is elgant modern, by any stretch - there are giant flat screens, loud college music, and that faint smell of stale beer that permeates just about every one of these kind of places in College Towns. Windows look out over MAC Avenue, always bustling with the life of the town. And that brings me to the innovation of What Up Dawg. I say that carefully. Innovating on Chicago Dogs is risky business. There are ingedients, and these ingredients can be amped up in size or quality, but in my experience, any attempt to modify past that detracts from the true nature of the dog. Until now. What Up Dawg. CHOPS the sport peppers. It rocks. 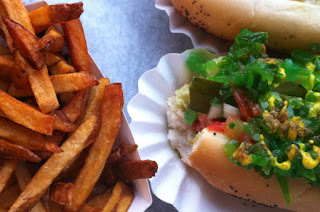 The bite of the pepper is more evenly distributed, and eliminates the rolling sport pepper, one of the main challenges of Chicago Dog consumption. The non Chicago Dog parts of the menu hold up well. Fries are crispy, fresh cut and a rusty reddish color when they come out. Sausages are local and juicy. The beer selection is decent, and includes my favorite go-to Michigan Brew, Bells. Comfort Food in East Lansing. One Down. Two to go. Ate there just the other day. Good stuff. Hit the right spot and the service was great.